The track plan evolved from two small layout plans that I saw on Carl Arendt's excellent web site Micro / Small Layouts for Model Railroaders. 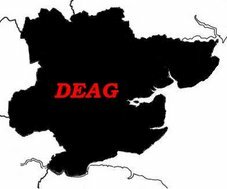 You will have probably gathered from the site title that it is aimed at north American modellers. Nevertheless there is much to inspire and I would recommend this site as a good place to start if you are struggling for a small track plan. This photo shows the track plan I proposed to build but after some discussion with fellow 2mm modellers I decided to remove the turnout shown ringed, reducing the layout to two turnouts. 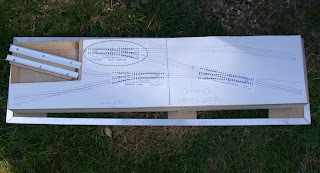 The track plan was transferred to the baseboard by taping it to the top and using a pin to punch through the paper along the centre line of track plan. Once the plan was removed I joined up the holes in the baseboard with a felt tip pen. I had in my storage box some built and part built track and point work from previously aborted layouts. I had more than enough for the track plan. 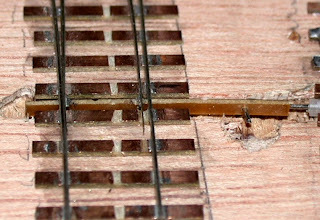 The track work is constructed using 2mm Association sleepers onto which is soldered plain nickel silver rail. This is done in a jig as shown and no chair plates are used. As the track will be buried when the layout is finished there is no need. Only one rail is soldered on in the jig and the resulting comb is stuck in place on the base board using white PVA glue. Once dry, the second rail is soldered into place using 2mm Association track gauges to set track gauge. The sleepers used were old style 2mm Association ones with the large gap. I built the two turnouts from the same materials as none of the old turnouts that I had was of suitable size. The turnout operating tie bar is as described in the beginners guide. 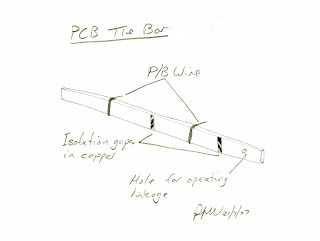 A piece of PCB turnout sleeper is laid on edge, two thin phosphor bronze wires wound round it and soldered in place. 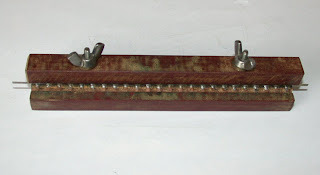 Tails are left which are soldered to the ends of the switch blades. The copper is gaped in two places and a hole drilled for the operating mechanism. The Beginners Guide describes the tie bar in greater detail and a copy should be on the workbench as you build your layout. At this point in the construction of Marks Quay I have not had to buy any additional items so the cost so far is still £1.50. Good to see some layout progress Peter. Why did you remove the third point, other than to reduce the number of points to be built? If it is in the scenic area, it will add to the trackwork interest and also reduce the number of traintable movements. I removed the third turnout to simplyfy the layout, it is less cramped as the turnouts were too close together. The baseboard is only 700mm x 175mm so I wanted to maximise the track for shunting. It was mostly out of view anyway and it was one less turnout to build. It would not have reduced the train table movements as the loco would still have had to enter the train table to clear the turnout. Thanks for the supportive comments it all helps to keep the momentum going.